For years, New York, London and Shanghai are some of the common place where investors look at in search of the meaning of greener grass on the other side. For a budding entrepreneur, the world is filled with endless possibilities, and in the region of Asia Pacific, where else can give your such opportunity but Singapore. For years, the Singaporean government has continued to build a strong foundation that handed internationally renowned companies the confidence to set up headquarters and hubs in the Republic. Singapore is a country that has reinvent herself as a business-attractive nation on the globe. Everything about her is carefully designed to be as friendly as possible for small and large entrepreneurs alike. From the company incorporation process, the taxation system, and the legal system, every single factor in this country is designed to be business friendly. 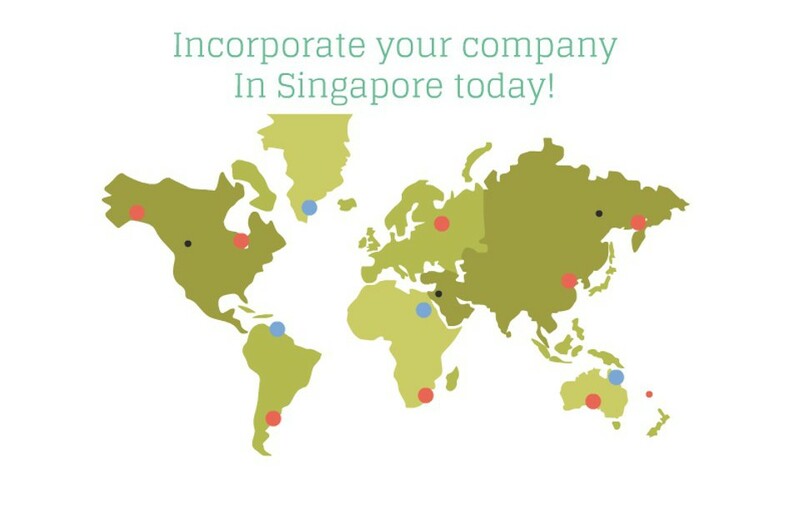 If you are thinking of incorporating a company in Singapore, then you have come to the right place to obtain the right information. By the time you are done reading this article, you will understand how to incorporate your company with ease. The entire process is easier than it may appear, because Singapore has eliminated bureaucracy as much as possible, just enough to become even more business-friendly. With an impressive list of start-ups like Grab, One Championship and PropertyGuru, Singapore is considered as the best place to start a new business. In order to build up a successful business, it is vital for you to understand why other similar capacity start-ups have failed before, and how do you improve from their mistakes. Entrepreneurs often overlook the value of conducting a market survey, something which has return to bite many investors. Also, if your team is lacking with dedication, has conflicting skillset, and has no ambition, the start-up is likely to fail. This is where we give you a few pointers to take note, so that you will have your business incorporated at ease. If you wish to start a business in Singapore, it is important that you familiarize yourself with the culture of the multiracial citizens that resides in Singapore. Acquaint yourself with the laws and regulations of the country, conduct as much research as possible to help your Singapore company incorporation sail towards the right direction. The last thing we want is any complication with the authorities. 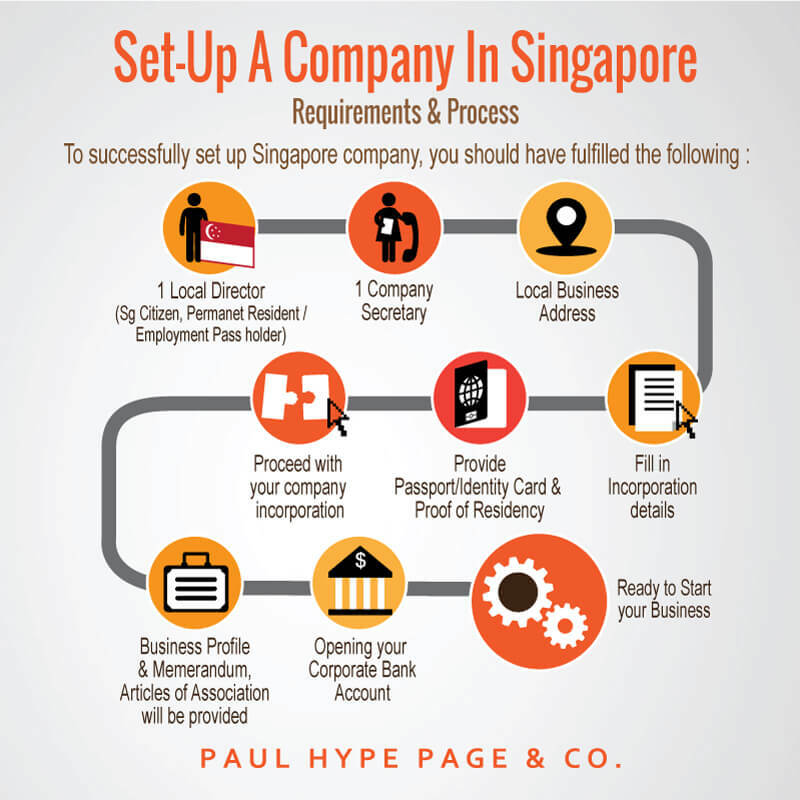 Fret not, because we at Paul Hype Page & Co is an expert when it comes to Singapore company Incorporation, and we will guide you all the way to the finish line. 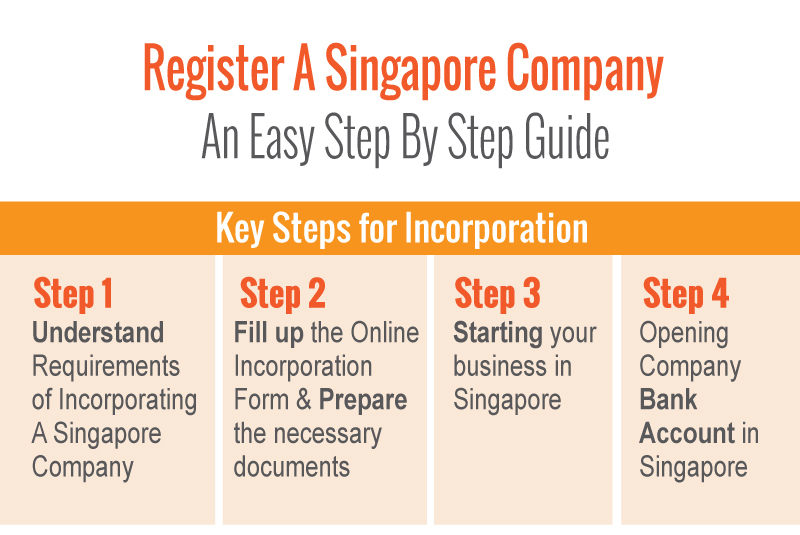 Under Singapore Company law, resident, non-resident individuals or entities cannot self-register a company. 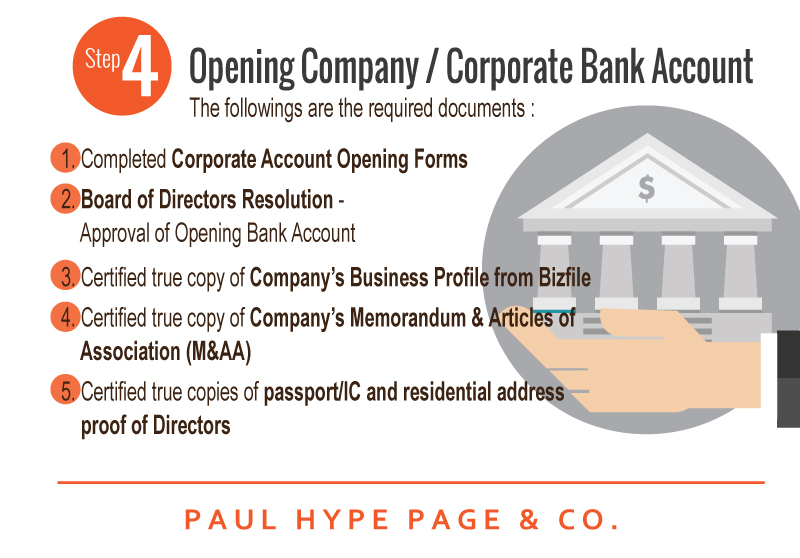 All Singapore Registered Companies, prior to the incorporation, must engage the Accounting and Corporate Regulatory Authority (ARCA) licensed service provider – just like Paul Hype Page & Co – to register your Singapore company. These two are the most important step before the rest, decide on the name of your company. It is then advisable to get your company a company business profile. This will be helpful when you are approaching investors and the authorities. There are several ways where companies can be classified. They can be classified because of their limitations, or they can be classified on whether they are a private limited company or a public listed company, partnerships or limited partnership. Based on their limitations, they can either be limited by shares, guarantee, or they can be unlimited companies. Have at least one director who is a local and legal resident of Singapore who is 18 years old and above. In addition to those who are appointed by law, any person other than a professional adviser for the company, with whose instructions the directors of the company normally comply is a shadow director. Alternate directors are persons who are nominated by a director to act in their absence. A de facto director is a person who has not been validly appointed or who is disqualified but who in effect occupies the position of, and acts as if he were, a director. Executive directors are directors of the company who are involved in the day to day management of the company. In practice, some of them may have specific titles within the company, eg, managing director, marketing director or finance director. Non-executive directors are not involved in the day to day management of the company. There is no legal obligation for a company to appoint non-executive directors. 2. An individual that has been declared bankrupt is disqualified from acting as a director of a company. 3.Being legal resident here refers in the context of an ordinarily resident in Singapore. This means the local resident director’s usual place of residence is in Singapore. A Singapore Citizen, Singapore Permanent Resident, or EntrePass holder can be accepted as a person who is ordinarily resident in the Republic. 4. If you are a S Pass holder or an individual with a legal visa (dependant visa, tourist visa and etc) to reside in Singapore, it is almost impossible to incorporate a Singapore company as this is determined on a case by case basis. 5. The visa holders mentioned must send an application to Ministry of Manpower (MOM), whereby their visa to be converted to an Employment Pass (EP). If approved, they can proceed to register their business and be the director of their company. 6.Foreigners who is not a Singapore Permanent Resident and wishes to set up his own business/sole-proprietorship is required to appoint a locally resident authorised representative, also known as a local nominee director. 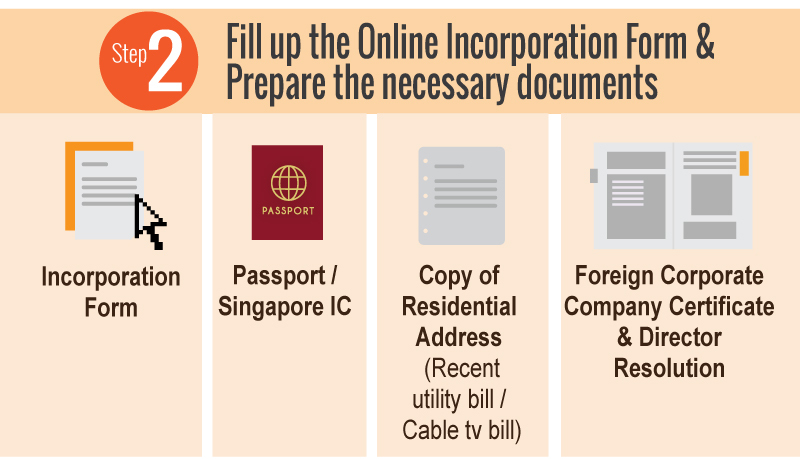 7.Identification documents for the director/ shareholders of the Singapore company, passports and special Director’s resolution certificate of incorporation. 8. MOM will run through a random check every 3 months, and whoever under the S-Pass and is a director and shareholder of a company will be booted out of Singapore. This cannot be a P.O box. Why? Because for legality, it is needed for an individual to be resided in an address. Home Office Scheme (2003) allows individuals to use their residential address as the business address. However, an approval will need to be obtained from the Housing Development Board (for HDB flats) or Urban Redevelopment Authority (URA – for private properties) if a residential address is being used as a business address. Approval is subjected to the discretion and guidelines of HDB and URA. Paid up capital derived from the share capital in the company. Share capital refers to the money that has been invested in the company by shareholders in exchange for shares. 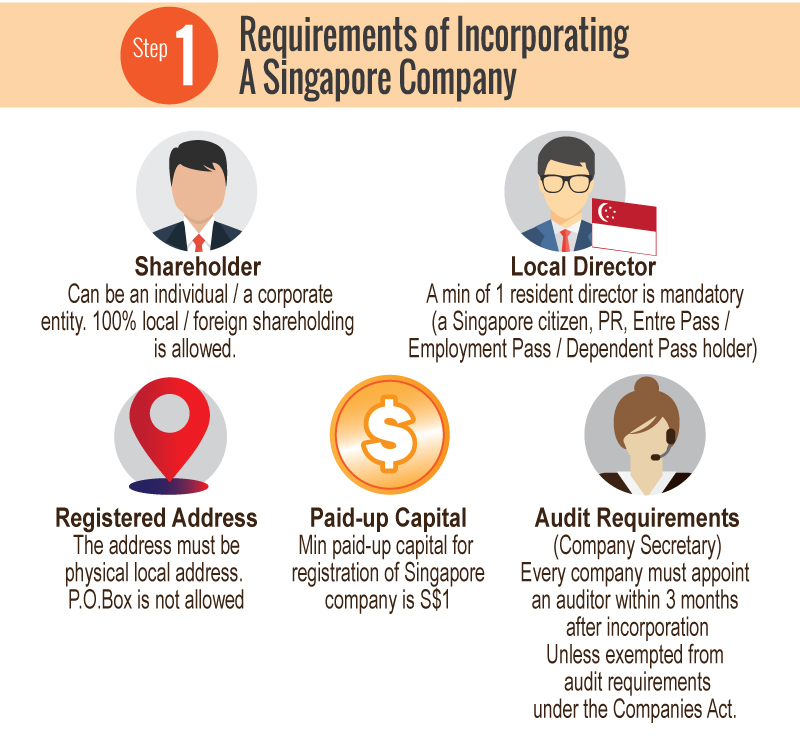 Under Singapore’s company law, companies can issue shares without obtaining payment from the intended shareholders. Hence, the total share capital of a company can be divided into two categories: paid-up capital and unpaid capital. Paid-up capital refers to the issued capital that is paid up by the investors and shareholders. For an incorporation, there must be a minimum input of $1 for the issued capital. Any Singapore citizens and Singapore Permanent Residents and foreign entrepreneurs who are relocating to Singapore need to only have the minimum paid-up capital of S$1 at the time of Singapore company registration. Foreigners who wish to relocate to Singapore under the Singapore Entrepreneur Pass scheme are required to invest a minimum sum of SGD$50,000 as paid-up capital at the time of company incorporation. Section 171 of the Companies Act requires all Singapore companies to have at least one secretary (but there can be more). The office of secretary cannot be left vacant for more than 6 months at any one time. Paul Hype Page & Co can act as the company secretary in the event of a vacant position. 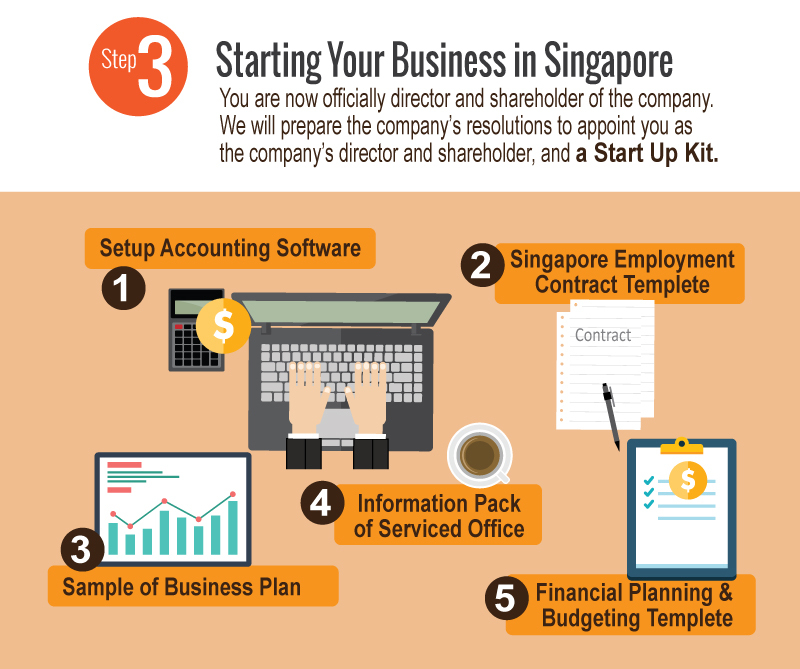 This is a vital step for any Singapore company incorporation. All our existing and new client will go through this step as part of the compliance process. Know your customer (KYC) refers to due diligence activities that all regulated companies must perform to ascertain relevant information from their clients for doing business with them. With our pending patent ibizfile system, together with the assistance of Dow Jones, the process of conducting a KYC search is easy, effective, and legitimate in accordance to the Singapore Evidence Act. 7.Create and keep in safe custody the company seal or company/branch office rubber stamp and pay the relevant government and professional fees. There are two ways when it comes to financing a company, Share capital and debt finance. While self-financing your start-up can be the best way, it comes with a big downside as you may just be left with nothing when the venture doesn’t pan out. However so, this may still be our suggested option. If you can get funding from your own reserves, there are a variety of ways you can go about it. One thing that you need to understand, those who provide equity capital (capital financing) to a company are ‘members’, and therefore have the rights of members conferred on them by the terms of issue of their shares. Lenders and other creditors are not members and do not have the rights of members. A shareholder agreement augments a company constitution and sets out the understanding of the various business parties, most importantly between the shareholders and the directors. Usually, when it is all smooth sailing at the early stage, or during the early stage of the business operation when profit is at marginal. However, when there’s soaring high income, that is when issue will arise, no matter what relationship the shareholders carry outside the corporate environment. The shareholder agreement is an important element in a business, whereby when there any dispute will be mediated by looking into the agreement. In this you will determine who will exercise the management functions of the company. Usually the work load will be divided equally, and if one party does not fulfil his/ her responsibility, then the agreement clause can be triggered. This will state what kind of obligations are necessary to ensure the company’s secrets are preserved and how can the founders be restricted from leaving and starting a rival company. How can the founders and investors recover their investments and what is the company’s dividend policy among the shareholder. Can the founders and investors sell their shares at any given time and what are the rule of thumb as per the agreement. In the event of an unforeseen circumstances, the remaining shareholders no longer have the benefit of the deceased or disabled shareholder contributing towards the business, and that the family will want compensation from the business. If the family is unable to wait for their payments, life insurance could be used to resolve the dispute. The agreement is a legally binding contract, and parties involved inside the agreement must follow the procedures outlined in the document or the bylaws to amend it. The procedure for amending a shareholder agreement can be detailed in the document itself. In either case, the subject must be proposed during the board of directors meeting and majority of the directors must agree that an amendment is appropriate. The board must then proceed to record its decision to amend as a corporate resolution. In any case, in Paul Hype Page & Co, we believe a shareholder agreement is very important for any Singapore Company Registration. This is a sub-topic that we are not a fan of writing, however, it is great for you to have a little knowledge on. In business, anything is possible, high or low, win or lose. If everything goes as planned with your company, then it is great news and we will be very happy for you. If it doesn’t, then you need to have an exit plan, which is to strike off a company. To have the name struck off the Register of businesses, a company will need to apply to ACRA. A striking off process takes about 5-6 months because there are several steps that need to be fulfilled in pursuance of the striking off. Application must be submitted to the Company Registrar. ACRA usually take 7 working days to process the application, based on the complexity of the case and whether the supporting documents submitted are satisfied. One will be sent to the Singapore governmental authorities. The company’s directors and secretary must not have any outstanding summonses and civil charges against any of them. After 4 months, a final notification that the company has been struck off the Register will be published, along with the date that the company is struck off. We have 3 physical offices located in Malaysia, Indonesian and Singapore., and we have yet to include our virtual office in Korea. Happy with our article? Want to know more? We are ever ready to help you! 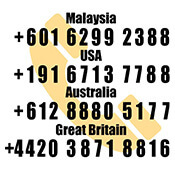 Contact us today and get your Singapore dream kick started.